Is Your Youth Hunter Ready for Deer Season? Deer season is approaching fast. Many states are in full license allocation mode and hunters should be starting to think about how to prepare for this upcoming season. Whether you are planning to take youth hunters out for the first time or another deer season, there are a few considerations to think about during the summer. This is the hardest question a parent has to face when deciding on taking kids hunting. One thought is that your kids can never be too young to start getting involved in the outdoors. While this is true, there is a big difference in getting kids involved in the outdoors and actually hunting with them. Youth hunters have to have the attitude and ability to be part of the hunt. Kids with a prepared attitude should be able to deal with harvesting an animal and have an understanding of the great responsibility that brings. Hunting with kids that can accurately shoot, be patient to sit for long stints and be able to physically and safely deal with environmental conditions are all important ability aspects. So what age should I start hunting with my kids? 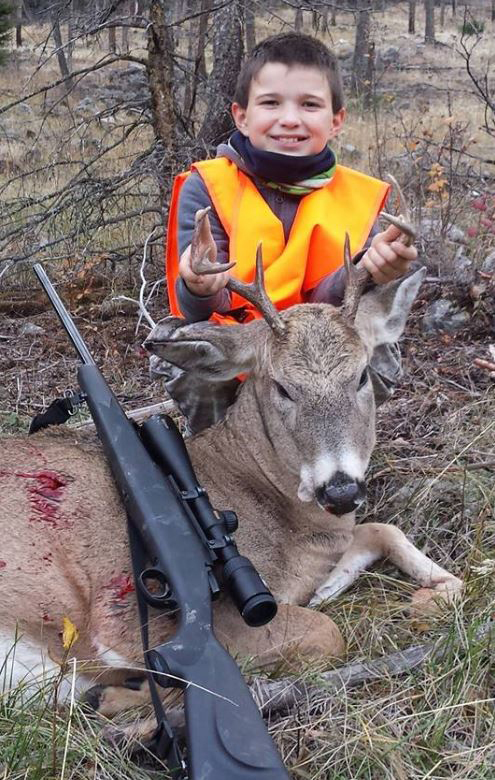 While there are regulations in many states as well as mentored youth specific programs for hunting, there is no specific age when a child is ready to hunt. You as a parent will know and be able to assess this summer how another year has added to their attitude and ability when it comes to being ready for this year’s deer season. Besides the experience and training, you can provide your youngsters, formal hunter education programs are ways to teach your child about hunting. These hunter education programs are often mandated for kids and required before young hunters can take to the woods or buy a license. Each course is designed to teach new hunters about safety, regulations and being a good sportsperson. Courses usually consist of a full day of classroom work followed by a test of knowledge, which requires a passing score to be able to become a licensed hunter. These courses are offered throughout the summer months through your state wildlife agency and in most cases in cooperation with local sporting groups. Age, and more importantly attitude and ability, determine when a kid is ready to go hunting. But how does one build those skills with youth hunters? The answer is what hunters have been doing for years and has recently become part of most state wildlife agencies programs. Mentored youth hunting programs are designed for kids who either do not meet the legal age or are not all the way there enough to fully take part in hunting. This allows younger kids the ability to learn all aspects of hunting, including harvesting certain game species within a set of specific guidelines. A powerful way to get and keep kids involved in hunting. As part of preparing for deer season, review your state game laws now in summer and see what requirements there are if you are thinking about taking kids hunting for deer this season. Safety in hunting comes down to weapon safety. Whether it be with a firearm or bow, nothing is more important than making sure your kids and other hunters are all safe while afield. Summer is the perfect time to practice safely operating a gun and getting comfortable shooting and handling it. Cover all aspects of gun safety such as handling the firearm, loading it safety, safe shooting and range and hunting etiquette. A good choice to start kids out with is a Gamo air rifle, which is easy to handle and has low recoil to get kids comfortable shooting safely. Summer camps that provide instruction on shooting, hunting and the outdoors such as the Raised Hunting Bow Camps are a complete and valuable resource to get your kids involved in the sport. Know your surroundings. Focus practice this summer on getting kids concentrated on the act of hunting. The most dangerous time hunting with kids, for them and you, is when they get distracted and forget about their surroundings with a loaded firearm. Be sure of your target. Teach your kids that you only pull the trigger when you are 100% sure of your target. When hours of hunting finally pay off with a deer within range, you need to be completely sure of your shot and what is around, behind or near it before you take the shot. Practice then practice again. Summer gives you the opportunity with longer days to spend more time practicing safety. Head out to the woods and practice situations your youth hunters may encounter during deer season. This will instill safety as priority one while hunting. 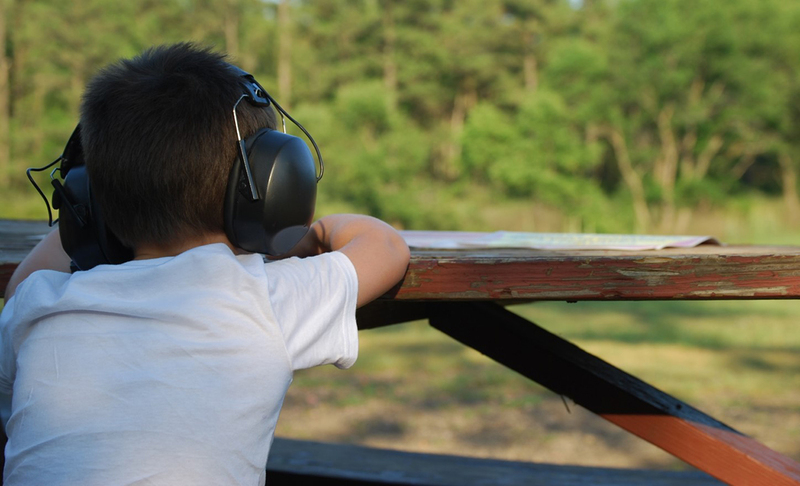 Along with safety and hunter education, there are a number of activities you can do this summer to prepare kids for deer season. Although there are much more, these three activities will have you and your kids ready to go on opening day. Spend time in the woods. A child’s hunting experiences will be much more enjoyable if they know exactly what they are in for. Taking kids in the outdoors often over the summer provides them a chance to explore the woods with you and get comfortable with all the sights and sounds. They will learn how to walk through the woods, look for deer sign and understand how game moves with the goal in mind of preparing for deer season. Gear up. Do not skimp on youth hunting clothes and other gear. They will be more comfortable and more likely to enjoy the sport if they are outfitted like a hunter. Start with Under Armour youth hunting clothes matched with a good weatherproof layer and topped off with a kids orange vest and hat. Also be sure to get quality boots to keep your youth hunters comfortable and dry. Gear up in the summer so clothing and boots can be broken in before deer season. The most important piece of gear, the youth bow or gun, should be very familiar for the youth hunter by now. If they do not have a bow or gun specific for their size then go get one! Plan Hunts Now. Each hunt is more critical than usual when taking kids hunting with you. A bad trip or two can quickly turn off the enthusiasm. Summer is when you want to plan your youth hunting Scout areas that are not too far off the trail and have little hunting pressure. Consider if you will be hunting from a stand or blind and be prepared with several locations within walking distance so you can move as patience wears. Have these spots prepared and ready to go come opening day. Preparing for deer season now in the summer is even more important if you are planning on taking kids hunting in the fall. Youth hunters should be properly educated and have the attitude and ability to be part of the hunt. 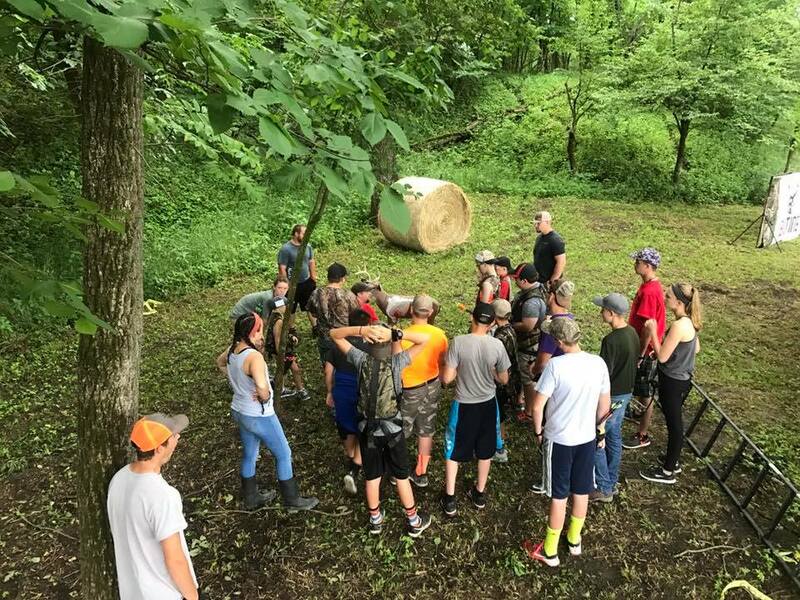 Focus summer activities on safety and basic hunting skills in these months leading up to deer season to ensure successful youth hunts this fall. Don’t know where to start? 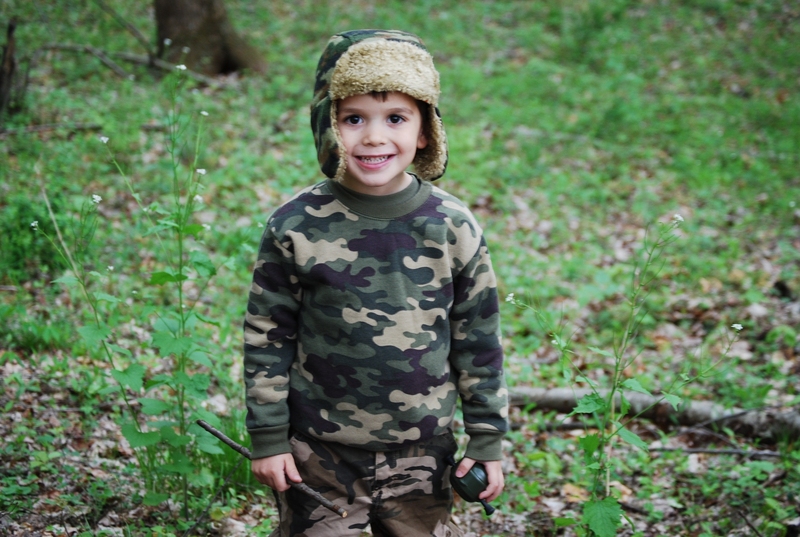 If your kid is the right age to begin hunting, then go ahead and start with the gear. Check out Whittaker Guns for great prices on youth guns, bows, and gear! After the gear, get them acquainted to it and go over hunting safety. 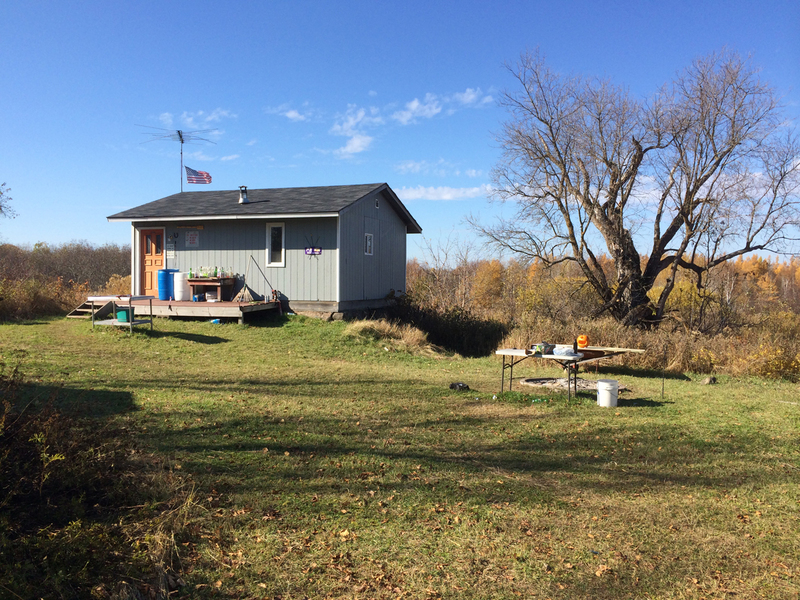 Then follow the rest of the blog’s advice all the way up until deer season! 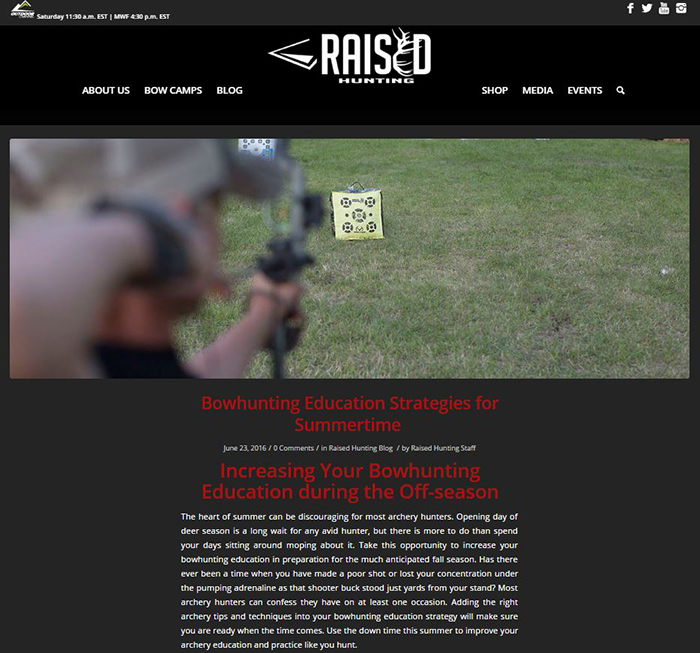 https://www.raisedhunting.com/wp-content/uploads/2017/07/summer-activities-for-youth-hunters-deer-season_Feature-e1499352536510.jpg 496 960 Raised Hunting https://www.raisedhunting.com/wp-content/uploads/2019/01/Raised-White-Shadow.png Raised Hunting2017-07-06 14:41:402018-07-17 09:35:53Is Your Youth Hunter Ready for Deer Season? Why Spring Is the Perfect Time to Get Kids Outdoors! Spring time is upon us, and it is a great time to share the outdoors with young outdoorsmen and women. Spring is youth hunting and outdoor season, and a perfect opportunity to introduce young men and ladies to the outdoors. There are many opportunities to spend quality time with youth in the spring of the year. Many states conduct youth turkey seasons, and special youth only draw turkey hunts. Working on food plot and stand strategies for next fall is a great opportunity to get young folks involved in the outdoors and next fall’s hunt. Introducing and developing young archers and marksmen is a great springtime activity to help young men and ladies develop hunting skills. Spring brings with it mild days and cool nights. The daylight hours lengthen and offer some of the best conditions of the year to enjoy the outdoors. These ideal conditions lend themselves to introducing young people to outdoor activities, or developing youth that has already begun their outdoor journey. Spring is youth season and a terrific opportunity. 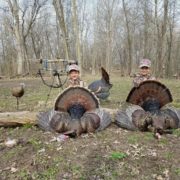 Turkey season and youth hunting is often the first thing that comes to mind when outdoorsmen and women think of spring. The same can be said for young outdoorsmen and women. All across the nation states host youth only turkey seasons, and youth only special draw turkey hunts. Turkey hunting for young men and women is a great introduction to the outdoors and the sport of hunting. Here is a list of some of the best locations for a great youth spring turkey hunt. 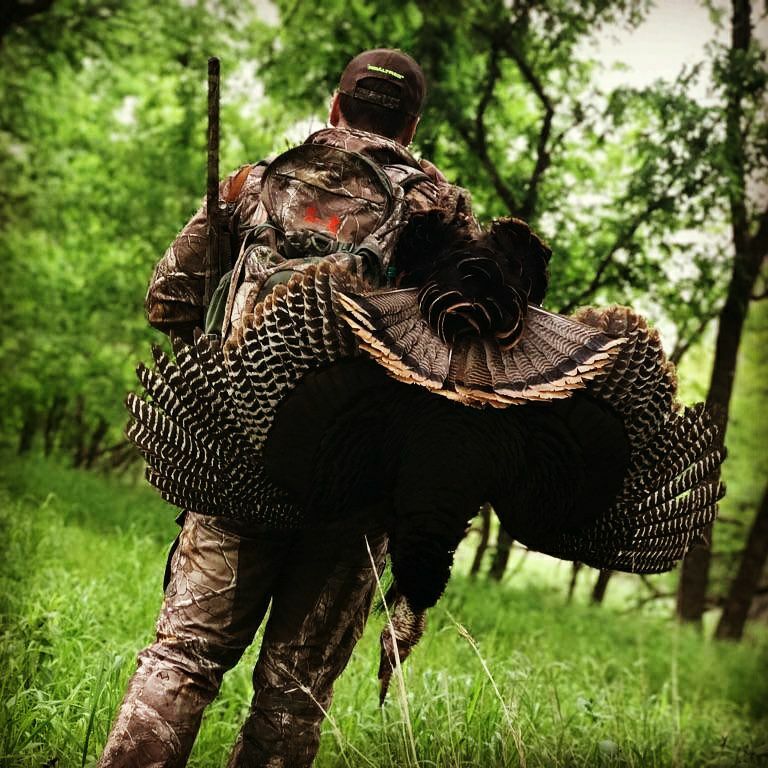 Mild temperatures and fast action that turkey hunting is so famous for are prime for young people wanting a heart-pounding introduction to the outdoors. For many hunters, spring means turkey season, spring can also be youth season. The sound of a tom gobbling in a stand of hardwoods echoing down a spring creek lined with green grass leaves an impression. A young hunter armed with a simple push – pull hen call, or a small box call can easily trigger a spring gobbler to sound off and leave a lasting memory in the heart and mind of a new hunter. A few key tactics like hunting from a blind, the use of decoys and locating the roost ahead of the hunt can play huge dividends in making a turkey hunt enjoyable for a youngster. A great activity to share with youth in the spring is work on food plots and stand strategies for next fall. The time spent in the deer woods in the spring and summer is much more low key. Noise and scent are much less of an issue this time of year, and it is a great opportunity to introduce young people to the outdoors. Spring is youth season, and youth cherish opportunities to learn and grow outside. 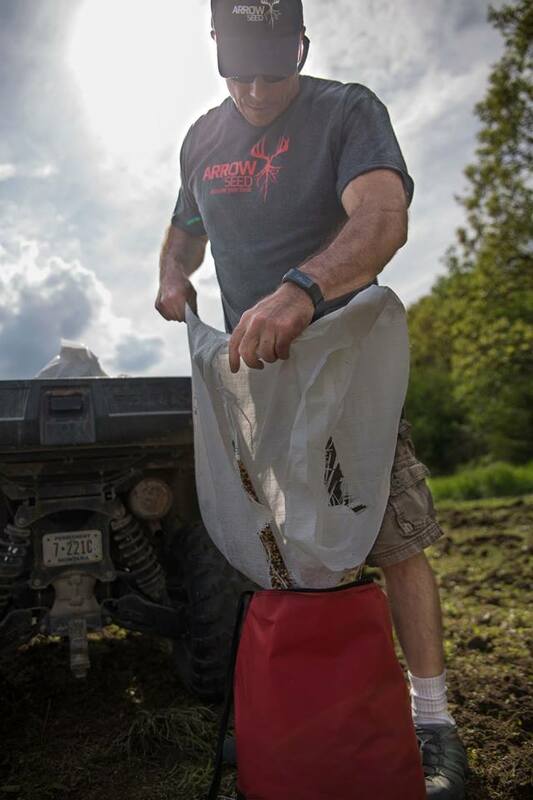 The deer woods and food plots are a terrific place to help a young outdoorsman or outdoorswoman develop a love for deer hunting and the outdoors. Putting a seed in the ground and watching it grow is something magical that leaves a lasting impression. Coming back to a food plot after seeds are germinated and growing, and wildlife is using and feeding on the forage a youngster help to establish is fascinating. Playing a critical role in the management and nutrition of the game animals is an amazing accomplishment that young people are happy to be apart of. Youth can also play a role in the planning and selection of stand and blind locations for next fall’s hunts. Working outdoors in the spring cutting trails, trimming shooting lanes and considering wind direction and food plots for next fall is great practice and an opportunity to learn a skill set for young hunters. Spring is youth season, and young people appreciate investing themselves and applying themselves. Working outdoors to develop next season’s hunting setup this spring is a perfect opportunity to involve youth in hunting and the outdoors. Spring is also a perfect time for young men and women to practice their marksmanship, and allow them to get more acquainted to equipment. 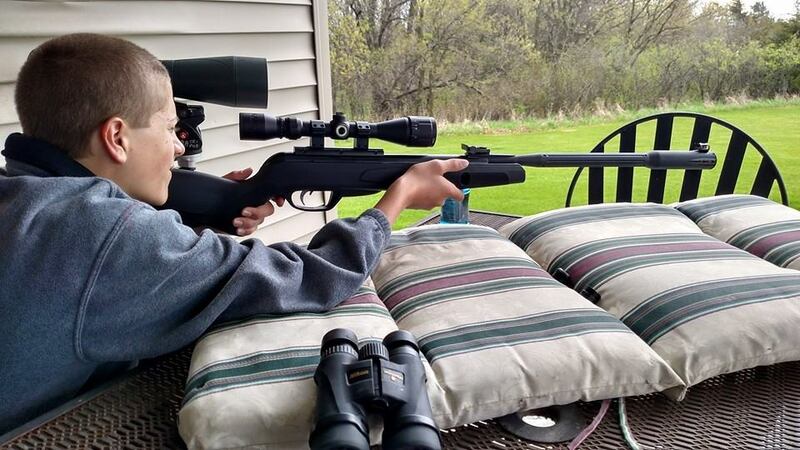 The mild days and longer daylight hours provide a great opportunity for youth to practice their shooting skills. 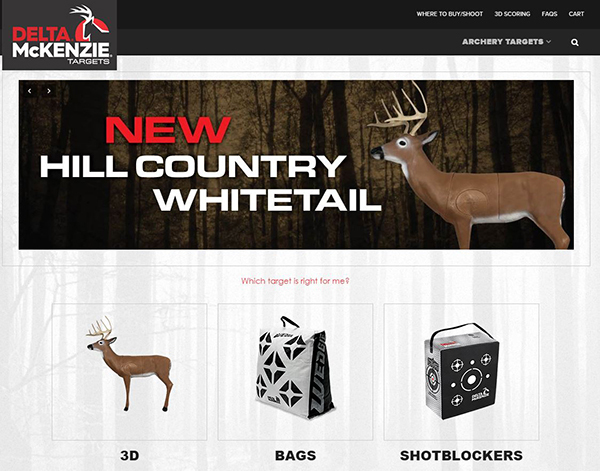 There are many products on the market for young men and women to develop the expertise with a rifle or bow. Time spent at a safe range with a qualified instructor developing safe practices and accuracy in the spring can go a long way in developing marksmen. 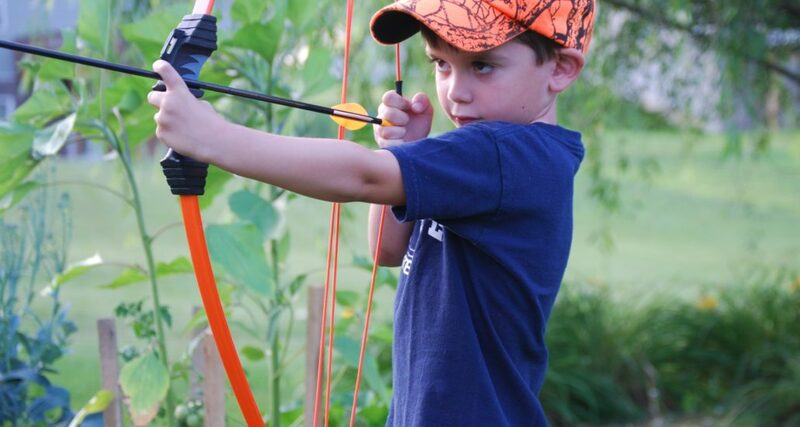 Spring is youth season, and youth developing their archery skills is a great spring pastime. Developing muscle memory with a bow and range estimating skills can often come as second nature to a youngster. Practicing correct form and repetition with a quality youth bow provides young archers with accuracy and confidence for their first hunts. 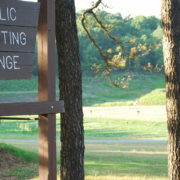 The mild days of spring spent at the range with young people learning to sharpen their marksmanship is time well spent. The spring season brings many opportunities with it to enjoy the outdoors. Developing the sportsman and sportswoman of tomorrow can get a head start this spring. Spring is youth season and a great time to get outdoors with a young person and pass along generations of outdoor tradition. Want to get your kids involved in the outdoors? Raised at Full Draw bow camps are a great opportunity. Click here for more information! 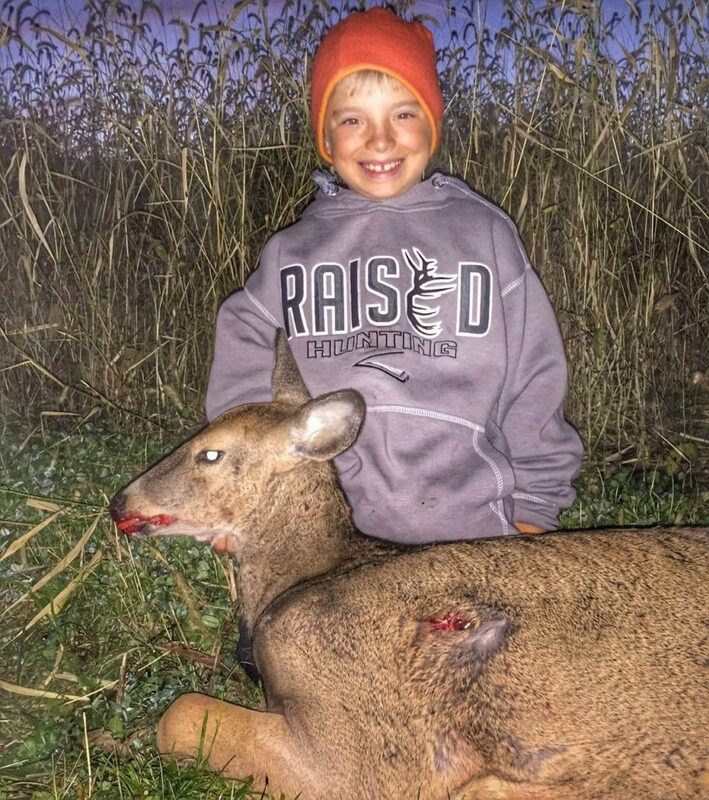 https://www.raisedhunting.com/wp-content/uploads/2017/06/youth-hunting-opportunities_feature.jpg 1080 1440 Raised Hunting https://www.raisedhunting.com/wp-content/uploads/2019/01/Raised-White-Shadow.png Raised Hunting2017-05-17 16:16:342018-07-17 09:35:59Why Spring Is the Perfect Time to Get Kids Outdoors! Anyone who has truly been raised hunting knows that it’s more than just filling some tags once a year — it’s a way of life. It’s about sharing a passion for the outdoors with family, adopting an active lifestyle, developing a conservation ethic and consistently honing those hunting skills. And that’s what David and Karin Holder are teaching kids through their Raised at Full Draw youth bow hunting camps. Fifteen years ago, David began working with a camp in Montana where kids learned elk calls, and he eventually started incorporating some hunting tips into the instruction. With insight from his sons who were attending the camp, David learned that the kids were most interested in the practical lessons they could apply in the field. 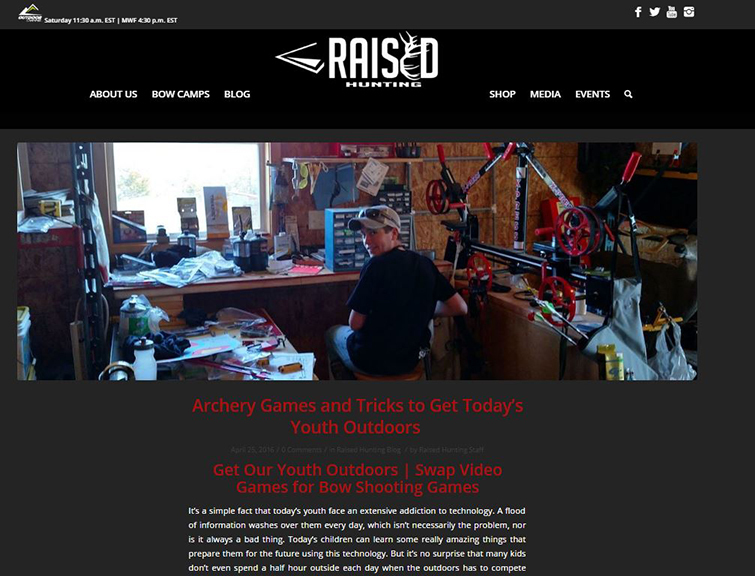 Click here to find out more about Raised at Full Draw Bow Hunting Camps! Snow is beginning to fall across the Country, and as the white starts to come down, a great time develops to slap on the Under Armour, break out the Bear bow, muzzleloader, or slug gun, and tuck in close to a food source in the preparation for some cold weather, late season hunting. 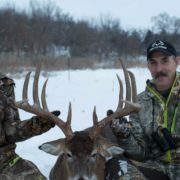 The months of December and January can be two of the best months to find yourself in the deer stand or box blind in search of your hit-list buck. White-tailed deer during the latter part of the season are no longer focused on breeding and have changed their attention to survival. This is especially true for mature bucks that are worn down from the heavy rutting activity. Success with late season hunting is all about cold weather, and keying in on food and cover. Although the conditions may be somewhat harsh, the late season can also be a great time to share the blind or deer stand with your friends and family. No doubt, if you read any article that discusses tips and tactics for late season hunting success it will make some reference to the importance of focusing on a food source. The reason you see the topic of hunting food sources continue to be repeated is simple, it is because it really is an important part of most late season hunting strategies. Now hunting food sources is not the end all be all, but keying in on these areas and building your overall hunting strategies around them can be a great move and can lead to putting a cold weather whitetail on the ground. When the weather turns cold and the snow begins to cover the ground, deer will begin to keying on food sources that are high in protein and carbohydrates. At this point in the year, whitetails and more specifically bucks are focused on replenishing their fat reserves and their body condition. They have been physical appearance and health has greatly deteriorated from heavy rutting activity. In order to make sure that they make it through a hard winter, food will constantly be on the mind. Not all food sources are created the same, however, so as a result there are some food sources that are sure to be more productive during the late season than others. For example, clover plots are excellent locations to ambush an early season whitetail, but during the late season, they have lost their luster. In contrast, forages like turnip and radish plots as well as grain fields like corn and soybeans can certainly be key areas to focus on during cold weather whitetail hunting. When you read about hunting grain fields during the late season, you often hear the term “standing grain”. Standing soybeans or standing corn is simply areas that have either been planted as a food source for wildlife or are areas that have been unharvested by the farmer. In both cases, these areas are exceptional areas for late season hunting. Standing grains do provide a little bit of a benefit verse hunting a completely cut corn or soybean field. The main reason is the ease in which whitetail deer can get to the food. Standing grains make it easy for the deer to access, whereas a completely cut field or even cereal grain fields like winter rye or winter wheat may be a little more difficult. This is exceptionally true when the cold weather hits and the ground begin to freeze or be covered with snow. That being said, both areas are exceptional locations to put a late season deer on the ground. There is another added benefit to hunting areas such as standing grain fields during the late-season, and that is simply visibility. Hunting a corn or bean field, especially from an elevated position can help you put your Nikon to work and allow you survey a large area from a distance. Hunting from an elevated box blind or tripod stand can be an excellent way to put a late season whitetail on the ground, but they can also help you in your overall scouting efforts as well. Often, hunting from these types of sets and treating them as more of an “observational stand” can help you further hone in on major areas of entry and exit into the food source, allowing you to move in close and hang a stand. Food sources are a great hub in which you can build your late season hunting strategy around, and should be high on your list of areas to key in on when the cold weather moves in. When the weather turns cold, we like to wrap up under a blanket next to a warm fire and just hang out. Occasionally, we will get up to stretch our legs and get something to eat. The same can be said for white-tailed deer during the cold weather of the late season. The cold weather and short days have the deer desperately clinging to the cover, conserving energy and only making an appearance when it is time to grab a quick bite to eat before the frigid temperatures of the night kick in. 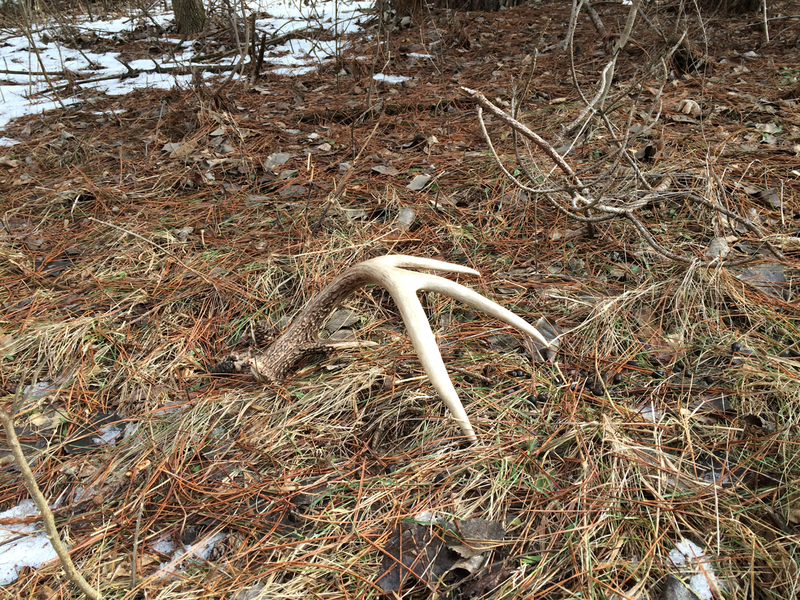 When you looking at the types of areas that whitetail deer tend to seek out during the cold weather of the late season, there are a few types of areas that tend to stand out over the others. The first is areas that have a southwesterly aspect. These areas tend to receive more direct sunlight during the winter months, and as a result are typically warmer with less snow cover than the north facing slope. Whitetail deer will key in on these areas and utilize these areas as bedding locations as well as mid-day loafing areas. Thick areas such as cedar thickets or woodlots that have had Timber Stand Improvement or other types of thinning practices completed will often provide the dense thermal cover that whitetails and other wildlife need during the cold temperatures of the late season. During other times of the year, it would be in your best interest to avoid putting much pressure on the bedding areas, choosing to hunt the perimeters verse getting in close. That philosophy changes during the late season. With time winding down, the late season is often the time to put on the ScentCrusher and tuck in close to the bedding areas. Hunting these areas can be challenging, but if you are patient and ensure that you have an easy way of entry and exit of the location, and ensure the wind is right for your set and you can find yourself sending around or a GoldTip down range. The late season is cold and usually wet and snowy. For some, it doesn’t necessarily sound like fun, but believe it or not, the late season can be an excellent time to get out on the field with your family and friends. There is something about cold weather that brings people together, and from the comfort of a blind or deer stand many memories can be made. One of the aspects of late season hunting that makes it so memorable is often the conditions. The cold conditions tend to stick in your memory banks, but it also makes the hot chocolate or coffee taste that much better. Another aspect of the late season that makes it so memorable and a great time to get your family and friends outdoors is the activity. The woods tend to come alive when the weather turns cold and the snow is on. Whitetails are not the only critters that tend to show themselves during this time as birds, small game, and other wildlife species are alive and well and make for some enjoyable hours in the stand. Whitetail hunting during the late season is many whitetail hunters favorite time to hit the woods, and if you find yourself in the position of still having a tag left to burn, some of the best hunting may still be ahead of you. If you get a chance to get out and brave the elements for late season whitetails you might just be happy that you did. Good luck! When Is the Right Time to Take Your Youth Hunting? Doesn’t it seem like each fall disappears in a crazy blur? Between schools starting back up, getting ready for winter, and of course hunting seasons, it’s easy to lose track of time. As a result, we tend to push some things off our plate, resolving to do them in the mythical “later” category. But “later” might not happen. That’s why it’s important to dedicate time now to life-altering things like taking your youth hunting. Think about it; if you go hunting with a child and patiently pass on your outdoors knowledge to them, you will theoretically create another grounded and responsible adult who’s connected to their food source and the world. Hunting teaches ethics, responsibility, patience, and respect. What more could you want for your children? So it’s obviously important to get your kids in the outdoors when they’re young. How young? That depends entirely on you and your child. Some kids are ready to go afield much younger than others. It can be challenging to teach them everything, but family hunting is also a great way to spend more time with your kids doing something you love. In this post, we’ll look at some common signs your child may be ready for youth hunting, and some tips to help you teach them what they need to know. If you notice the following behaviors about your son or daughter, they may well be ready to head to the woods with you. First, if they’re asking to come with you on a hunt, it’s definitely time to start doing some kind of outdoors activity with them. Even if you’re just doing a mock-hunt (discussed below), it’s a great time to get your youth outdoors. 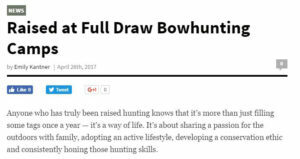 Similarly, if they routinely ask a lot of questions about hunting-related activities, show them in the field instead of simply telling them. Better yet, put them in situations where they can learn the answer on their own without having to explain it. If they are going on make-believe hunts on their own, they’re probably ready too! If they are intensely curious when you bring a wild game animal home, they may be ready. Encourage them to hold or handle the hide, antlers, feathers, etc. and teach them throughout the butchering/processing task. Some people worry their kids may be too sensitive to see a dead animal. If they seem to be bothered by it, explain the emotions you feel when hunting and that you’re respecting the animal by eating it around the table. One of the best and most important things you can do to teach your child about hunting is to be patient. Kids are going to be too loud in the woods, make mistakes, have short attention spans, and do all sorts of other things that will make you think about quitting. Keep your emotions under control and use any mishaps as teachable moments. You also may want to start them on smaller animals, such as birds, squirrels, or rabbits. These seem to carry less emotional weight for most kids, and are more their size. As they get used to hunting small game animals, start to introduce larger ones like whitetails. Try to make every hunt or time in the woods as fun and enjoyable as possible for them. It’s not the time for all-day sits or extreme temperatures either. Keep the field adventures short, comfortable, and enjoyable. The more fun they have, the more likely they are to want to go back. From there, you can slowly introduce reality to them without putting them off. Think back to your first successful youth hunt. It may have been exhilarating. Or it may have caused some tears to flow. Teaching your kids beforehand about the emotions they might feel is a good approach. Watch hunting shows with them and show them the wild game you have killed. How do they react? When/if they make a marginal shot and are kicking themselves for it, encourage them. Let them know that it happens to everyone. But as long as they do everything they can to find the animal or exhaust all possibilities, they haven’t done anything wrong. Also let them know that killing an animal shouldn’t be done lightly, and that they deserve a lot of respect by hunting ethically. If they seem like they’re interested in hunting and you have done a few of the steps above, it’s time for your first hunting trip together. Ask them if they’d like to go hunt with you in a ground blind somewhere. Obviously if you’re hunting with kids, you shouldn’t go on a high-stakes hunt after a hit-list buck or you’ll just get frustrated. Instead, simply set up a ground blind in the backyard where you can watch wildlife, even just squirrels or rabbits. Use the time as an opportunity to teach basic hunting skills (e.g., how to be quiet, how slowly to move, how to listen and look for animals, etc.). If they like sitting with you, you could bring a Gamo® .177 or .22 caliber rifle with and have them shoot their first squirrel or rabbit. This is assuming that they have gone through all the necessary firearm safety courses and are legally able to hunt, of course. If they are interested in bow hunting, consider sending them to bow camps for children where they can learn about archery. 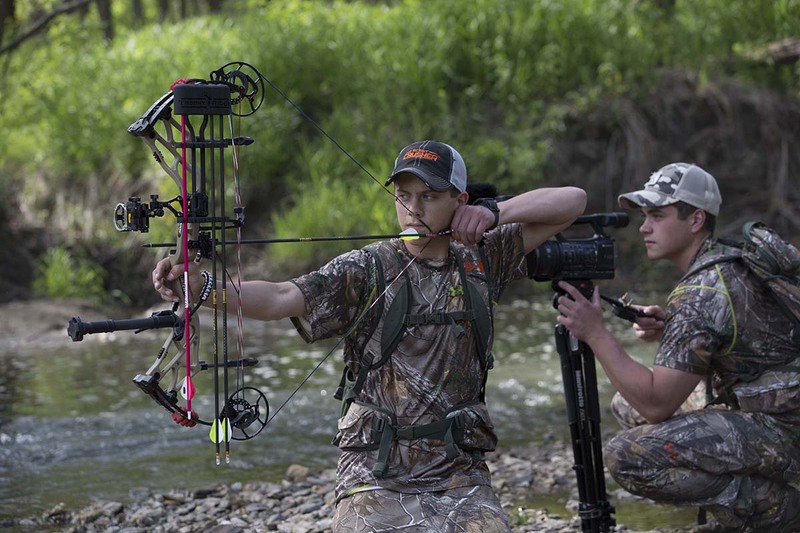 If they’re really interested, consider getting a Bear Archery® youth hunting bow. As they get better about hunting small game animals, it might be time to introduce them to larger ones. If they’re not quite ready for a full day in the woods, take them out after you get an animal to help you track the blood trail. After you shoot a whitetail, for example, follow the trail and check to make sure they are down. Then bring your kid out to “help” you find it. Show them where you shot it, and help them stay on the blood trail. With your helpful nudges, they should eventually lead you to the deer. Explain how grateful you are to them and that you could have never found it without their help. 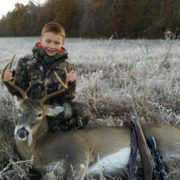 This encouragement and the excitement of finding a deer usually cements their interest in youth hunting. Your passion and enthusiasm is contagious with kids, so let them see it in your actions. After they’ve helped you in the woods, try a few co-sits together, where you’re both actually in the tree stand or ground blind with the purpose of hunting deer. While there’s not a lot of required hunting gear for kids, make sure that they are dressed in appropriate and comfortable youth hunting clothes like Under Armour® clothing. Stop by Scheels® to load up on any essential hunting gear for them. Offer help or advice to them throughout the trip, but also use it as an opportunity to test their skills and knowledge. If they do really well without your help a few times, they’re probably ready for their first deer hunt all by themselves. If possible, try not to impose too many quality deer management rules on them their first year. Let them take a doe, a spike buck, or a mature buck – anything they want. This will keep them interested and lay the foundation for future hunts. Taking kids hunting can be a lot of work, it’s true. But youth hunting is also some of the best quality time you can spend with your child. If you start exposing them to the outdoors and wild game at a young age, they will be much more likely to become confident hunters one day. And you’ll have created one of the best hunting buddies you could ever have. 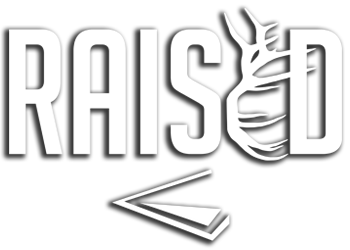 https://www.raisedhunting.com/wp-content/uploads/2016/11/when-is-the-right-time-to-take-your-youth-hunting-feature-2-1.jpg 540 960 Raised Hunting Staff https://www.raisedhunting.com/wp-content/uploads/2019/01/Raised-White-Shadow.png Raised Hunting Staff2016-11-21 14:23:252018-07-17 09:41:52When Is the Right Time to Take Your Youth Hunting? Summertime means many different things to different people. For most of us, it’s a time for backyard barbecues, hanging out at the lake, and maybe improving your golf swing. But for bow hunters, it’s also a time to get ready for the upcoming season through regular summer archery practice sessions. But that’s not always the case, is it? All too often, we start the spring months telling ourselves we’re going to practice every week until we can almost shoot blindfolded once archery season opens. But our plans to become the modern day Robin Hood start to lag behind as the kids start summer break, the lawn needs mowing, the fish are biting, and any number of other distractions start to take their toll. Before we know it, it’s already August and we haven’t practiced more than a couple times. This puts more pressure on you to cram a lot of bow practice in before opening day. The problem with this last-minute approach is that we tend to overdo it. We start flinging so many arrows that our archery shooting form can get worse and we develop bad habits. We also don’t have time to work out any kinks with our hunting equipment or really fine-tune our bows. Worst of all, we expose ourselves to injury when we go from not shooting at all to shooting dozens of arrows a day. A pulled shoulder muscle or rotator cuff issue could put you out for the season. Nobody wants that. Looking for a simple solution? Start your bow practice now so you can have enough time to truly get proficient again without sacrificing your health or form. Regular archery practice builds muscle memory, so that shooting a bow becomes second nature to you. When the moment of truth comes, you can simply focus on the deer instead of all the micro-decisions about your form and where to aim the pin. As you’ve heard before, only perfect practice makes perfect. Let’s talk about how you can make it perfect this summer. The best way to stick to regular practice sessions is to simply create a new routine. If it’s not scheduled into your calendar, it probably will get skipped (just like cleaning out the garage and painting the tool shed). It doesn’t take long to build a new habit, especially if you take a few precautions. Pick a designated day of the week that you will practice, no matter what. For example, choose Wednesday evenings after work or Saturday mornings before the weekend activities get too hectic. It can really help to get others involved too as an accountability partner. A family member or friend should keep you honest when you don’t feel like going, and you should do the same for them. 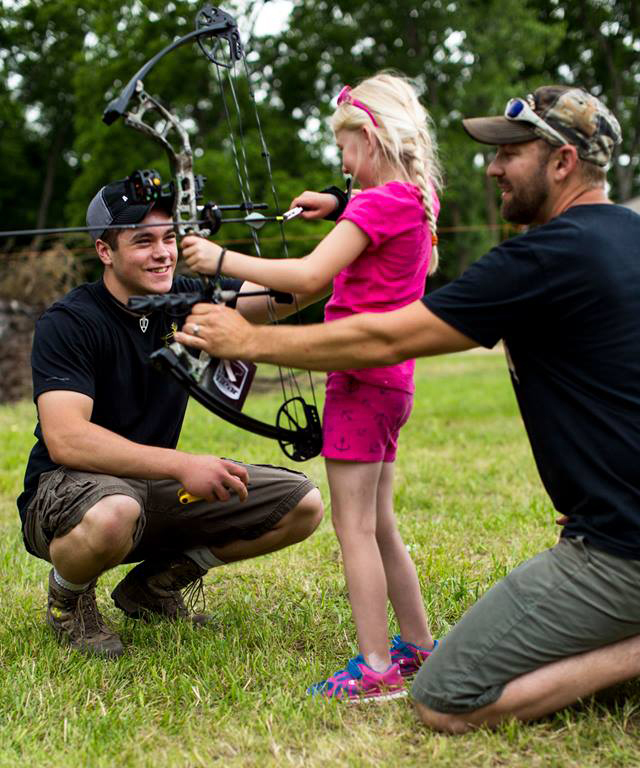 If the whole family hunts, you can make a new summer routine of practicing your bows together for some more family time. If everyone’s on the same schedule, there’s very little leeway to skip it. If you’ve got the room to safely do some archery practice in your backyard (and it’s legal where you are), consider yourself fortunate. The backyard or somewhere very close is the best possible place to practice because it eliminates the primary excuse that most people have. If they have to load their bow and archery practice targets into the truck and drive somewhere just to shoot a few arrows, they’re much less interested in following through. As we said, there are lots of other distractions in the summer. But if you can simply walk out behind your garage or shed, where an archery target is already set up and waiting, you have no excuse. Archery practice at home can save you a lot of time. We’ll chat more about the details below, but it doesn’t take many arrows to build muscle memory and work on your form. Just take a few minutes to shoot one quiver, and call it a day to move onto your other activities. Easy. If you must go off-site to practice, just realize that you will be tempted to skip once in a while. That’s where your accountability partner comes in. Early in the summer, you just need a safe place to shoot without getting too fancy. An open field will work perfectly as long as you get a good target and backdrop. But as opening day approaches, you may want to find a 3D archery range to make practice feel more realistic (more about that below). You’ve probably heard it a hundred different ways, but your form is really important when it comes to making consistent and accurate shots with a bow. 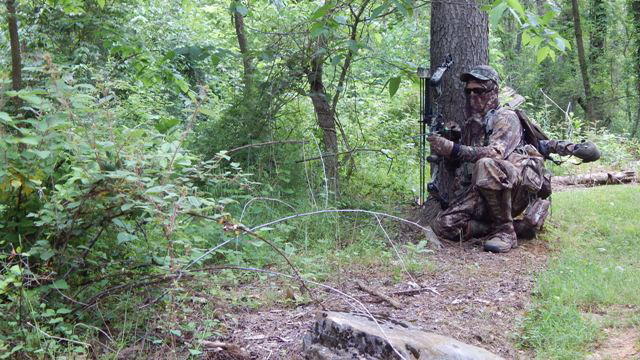 Early in the summer is the time to practice and enforce good habits, so that you can focus on realistic bow hunting scenarios later in the year. Here are some pointers to keep in mind as you’re doing the archery practice drills below. First, find a reliable anchor point for your release arm. It doesn’t matter if you choose your nose touching the string or your first knuckle lined up on your upper jaw. As long as you’re consistent, it should work. Even better, find a few anchor points that you can quickly reference in the field to keep your form consistent. Many bow hunters also close their non-dominant eye to focus on the pin when they shoot. This limits your peripheral vision and can cost you valuable visual insight. Practice keeping both of your eyes open and focusing on the target instead of the pin, which will help you develop an instinct for the right shot and avoid tunnel vision. Finally, another common form issue involves your bow arm. Many people drop their bow arm too quickly after a shot. It’s a natural reaction, but you can affect the flight of your arrow if it’s done too quickly. Start off by using a 5-second rule. After the shot, audibly count to 5 before you move your arms. It will feel really awkward the first couple times, but you’ll quickly develop a muscle memory for it and it will become second nature to you. When you’re doing your bow practice with family or friends, they can help critique your form. They’re already watching you and can see what you can’t, which may just help correct a really bad error before it becomes too engrained. Plus, having someone else watch how well (or poorly) you shoot adds a certain pressure. You’ll feel a little nervous, which is how you’ll likely feel in a hunting scenario anyway. If you have children, consider sending them to a bow camp, like Raised at Full Draw to learn important archery skills and learn from watchful eyes in a team environment. Archery target practice can get old quick if you’re shooting the same 10 arrows in the same way every single day. Luckily, there are countless ways for you to stay interested in regular summer bow practice. To stay committed to your practice, you need to find new ways to keep it fresh and have fun while you’re doing it. Below, we’ve collected just a few of the ways you can stay addicted to bow hunting throughout the summer months. Summer archery practice doesn’t have to be all work and no play. In fact, having fun is one of the best predictors of success there is. If it feels like work, you won’t want to do it in your spare time. And if you’re practicing with the family, you almost need archery games for youth to keep them interested so it doesn’t feel like just another chore. Here are a few archery games you can play with family and friends to have fun with archery this summer. If you’ve played HORSE in basketball before, you can do the same with your bow. Archer A shoots at the target from a place they choose in a way that they choose (e.g. standing, sitting, etc.). Archer B then needs to do the same shot in order to pass the round. If they miss their mark, they earn their first letter (“H”). For the next round, Archer B should shoot first and A will follow. You continue in this fashion until someone has spelled the full word, “HORSE”, and they lose that game. Archery practice games like this are perfect for kids who play basketball since they already know the rules and it adds a competitive edge. If you’ve got the room for it, one of the most fun archery target shooting games involves long-distance shots. You can challenge yourself or a friend or family member to beat the distance of whoever shot last. It’s addicting to see who can shoot the furthest, but it will also help you in a few ways. Closer (normal distance) shots will feel a lot easier when you’re grouping arrows at 75 yards. But it’s not just for the mental game. Even if you’re not comfortable with long-distance shooting ethics, you may have a situation where you only wound a deer and get a second chance as they bound out to 70 yards. Being able to make that shot on an already-wounded animal may be your only opportunity to kill and retrieve it. For these games, you can simply use old or cheap arrows for target practice since there is a good chance you could strip the fletching or even split an arrow. You definitely don’t want to use your best arrows for bow hunting. As your practice continues though, you should definitely switch out your arrows for target practice to shoot a few of your Gold Tip hunting arrows to make any adjustments to your bow before the season starts. If you’re focusing on building muscle memory, you might as well do it under as similar conditions as you’d hunt in as possible. You don’t necessarily need to do these in the beginning summer months when you’re simply getting your body used to shooting a bow again. That time is more about getting your form down again. But as the summer wears on, it helps to put yourself in a hunting simulation, if you will, to prepare your mind and body for the real deal. There are many ways to make your summer bow practice feel like an actual September bow hunt. Around mid-summer, it helps to start shooting at 3D archery targets, which have several advantages over a 2 dimensional target face. You can find many bow hunting targets for sale that will fit what you’re looking for. They help you form a mental image in your head where you need to aim regardless of what angle the animal is facing. It’s very different than shooting at a 2D surface. If you aimed for the behind the shoulder shot at an animal that was quartering away too much, you probably wouldn’t get a kill. You need to adjust it further back, usually using the animal’s front leg on the other side as your guide. That mental image also helps to beat your nerves when you see a real animal beyond the pin. After shooting at bullseyes all summer, it’s hard not to get a little jumpy when you see a real deer. To start adding some realistic details, try to simulate that excited feeling you get in a stand. No matter how many deer you’ve shot, a mature buck can still get your heart pumping (if it doesn’t, you probably shouldn’t be hunting). Since it’s hard to cause an adrenaline rush through mental imagery alone, you can use this physical hack instead. After the deer target is set up, you have a bow and arrow ready on the ground, and your release is on your wrist, go for a quick sprint. How far depends on your physical fitness. It could be a 10 yard dash or a 50 yard sprint. You want to be breathing pretty hard and a little shaky. Run to your Bear Archery bow and nock an arrow, shooting the target as soon as you can. This physically shaky state can partially replicate a real shot. It’s most useful later in the summer when your form is already dialed in and you just need to start preparing for the real deal. Another way to add more realism to your summer bow practice is to shoot the way you’ll be hunting. For example, if you’ll primarily be in a tree stand, take your shots from a tree stand or other elevated position. This again changes the shot angle, which is easy to see on a 3D target. If you’ll be in a ground blind, practice shooting from one in a seated or kneeling position. You may also want to practice a few shots in low-light conditions, when you’re most likely to see a bruiser buck in the woods. As you get more comfortable in these situations, you eliminate potential surprises that could interfere with the real hunt. 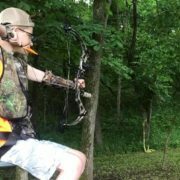 While it can be miserable to do in hot summer weather, wearing some of your hunting clothing while you shoot will help to get you used to the different form and technique that’s required. Finally, you could take it to the extreme towards the end of the season to really get your head in the game. One of the best archery practice tips is to simulate a real hunt as best as you can. Get into a tree stand with your hunting clothing on. Only bring 1 or 2 arrows with you. These are the only arrows you’ll shoot for the day, so you need to make them count without 5 warm-up arrows. In reality, 2 arrows are probably the most you could get before a deer runs out of range anyway. Try to simulate the same feelings and remain as stealthy as possible. As opening morning gets closer, limit your archery practice to only a couple arrows a day. This reduces your chance of a repetitive stress injury right before the season starts, but it also helps shift your mindset to a 1-arrow opportunity. 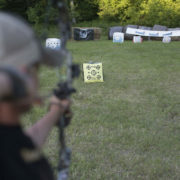 Summer bow practice is really critical to improving your archery success. It allows you to experience many of the same feelings and situations you might find while hunting with a bow, which helps to prepare your mind for the real deal. 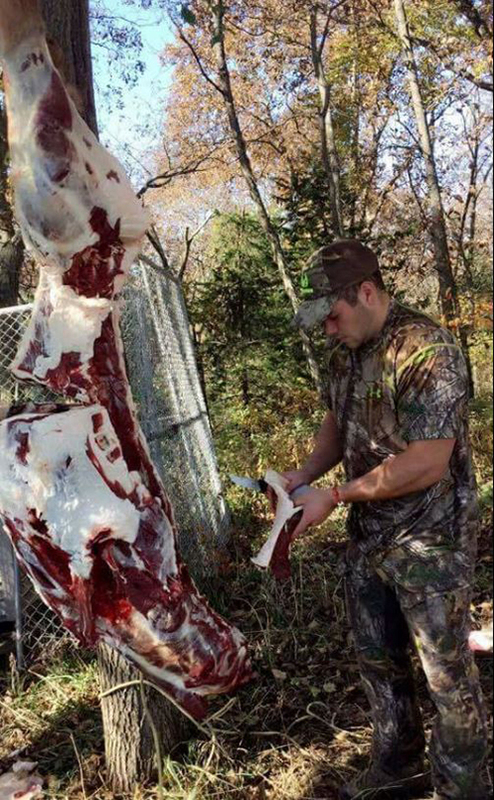 Bow hunting is largely a mental game, but there is some physical muscle memory that you can work on too. The sooner you get started, the better your results will be. Connecting kids to the outdoors and passing along the traditions you grew up with are some of the most important reasons to get into the woods this spring with a child. Hunting, and particularly youth hunting, instills values, encourages healthy living and develops life skills such as discipline, respect and good sportsmanship. 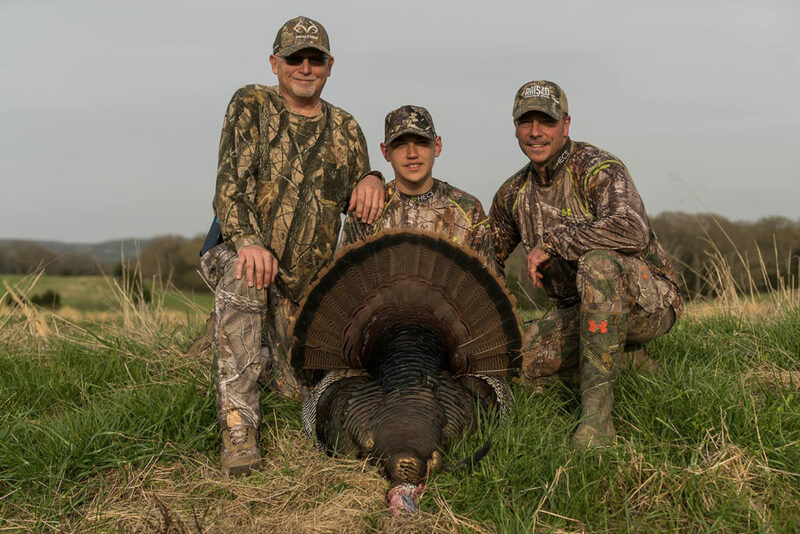 Spring turkey hunting is an opportunity for outdoor youth adventures to start a child’s lifelong desire for hunting by cultivating them into outdoor enthusiasts. Think about the real reason most of us hunt. Part of hunting is certainly about being successful. Successful hunts, however, are not only defined by harvesting an animal. Most of us hunt because we love seeing game from one season to another. Hunters are outdoors people. We enjoy sitting in a stand during a silent evening sunset or listening for the sound of a turkey gobbling as the sun begins to rise on a spring morning. It is for these moments and the countless others that keep us preserving the sport. We get to see things in the wild that most have never seen and that brings with it a sense of triumph whether or not we bag an animal. Youth hunting is about getting kids excited to be outdoors. Again, we all enjoy harvesting an animal but most of us are in the woods as much as possible because we are outdoor enthusiasts. Young children are geared for exploration. Make each hunting experience, from the very first hunt to when they start mastering the craft, an outdoor youth adventure. Allow them to explore the woods. Encourage kids to observe the natural environment around them by gathering insects or looking for birds. Teach them about the wilderness which surrounds them, such as names of trees or why a plant is growing in a particular area, all while making the connection between animals and their habitat. Spring turkey season, especially later in the year, is perfect for introducing kids to hunting. The weather cooperates more than deer season making it easier to get youth outdoors. Warmer spring weather also means activity in the woods. Animals are active as flora and fauna begin to awaken from winter. Youth turkey hunting is much less about landing a gobbler but more so about introducing your child to the outdoors. Get youngsters geared up with a youth turkey hunting vest and other youth hunting gear so they feel like part of the hunt. If you have the opportunity, hunting out of a blind is the best way to go after turkeys with a kid. Blinds, combined with the right gear, provide more comfort for kids than setting up next to a tree on the ground. Kids can move around and softly talk in a blind while maintaining concealment waiting for an approaching turkey. A simple box call like the Primos Matchbox is a great addition to their youth turkey hunting vest. Show them the art of calling and let them practice even though it may be a bit scratchy and inconsistence, it gives them a sense of accomplishment in the field. End the hunt when they are ready. Do not push young hunters to sit for long periods of time or be uncomfortable from weather. Have fun and keep them engaged for the purpose of the hunt without the rigidity of your normal turkey setup, and the more successful your youth hunting experience will be. (Video) – One of the most important parts of using a hunting blind is what goes in with you. You can move less and be comfortable than you will be more successful. Safety – Hunting safely should be at the forefront of every hunter’s mind and even more so when afield with a child. Teach your children to respect and be aware of other hunters while in the woods. If that means wearing a youth orange vest for safety walking to and from your hunting spot, then do it. As they mature, get your kids involved in hunter education programs such as hunter safety courses, local sportsmen clubs and outdoor youth programs like the Raised at Full Draw Bowhunting camps. Safety is not always related to hunting. Kids are curious so be mindful of the potential for snakes and biting insects. Remember that accidents can happen to anyone, and hunting with someone who is inexperienced increases the likelihood. 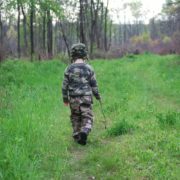 Don’t assume your child knows the ins and outs of hunting safety, but rather teach him or her through your own safe habits and behaviors in the woods. Correct Expectations – Setting unrealistic expectations can ruin not only your hunt but can be disastrous to your overall outdoor youth adventure. Young hunters are going to be restless. Keep in mind the hunt is more about exposing your child to the hunting experience than harvesting an animal. Encourage them to ask questions. Keep youth hunting trips short and active. Sit for a little and call them move on to another spot, only if it is just a 100 yards away, it will keep kids interested in the thrill of the hunt. Preparation – Preparing for a hunt is one of the most important phases. Be prepared with everything your child may need in the woods. Throw some snacks and drinks into your pack to refuel along the trail. Bring extra youth hunting clothes or rain gear in case it gets unexpectedly cold or rainy. Add a first aid kit to your youth hunting stuff to be ready for any minor injuries like cuts, scratches or bug bites. Also, have your child take part in hunting preparation. Let them pack their youth turkey hunting vest with the items they feel they need, which gives them an opportunity to contribute and gives you the chance to show them how to successfully prepare for a hunt. Youth hunting is not for every child, and that’s OK. Don’t force it. The more a child feels pushed into outdoor youth adventures, the less he or she will want to do it. Back off and eventually your child may ask to go hunting with you. The earlier you introduce hunting to kids, the more likely they will continue hunting into adulthood. Use these early years to educate with the knowledge you have gained from your years of hunting to show them the wonderful outdoor world. Creating these outdoor youth adventures will produce a sense of purpose in the woods and continue the family hunting tradition. The time you spend outdoors with your children provides lifelong memories, ones that will instill within them the passion to pass along hunting experiences to future generations.